It was clear right from day one that there was something different about my son. He didn’t have that dreamy, half-conscious look of most newborns. He was unusually alert and awake with intense eye contact. The nurses on the maternity ward were calling him “the little professor“ or “Einstein”. Others said, “he’s an old soul”. What was it they were seeing when they looked into his eyes? Over time this became clearer. Nursing him was only possible in the context of complete silence, as at any sound he would wrench away from me in alarm, turning his head to and fro, searching frantically for the source or alarm, while at the same time crying for the breast. When he finally calmed enough to find the breast again, he drank so desperately that he would get a stomach ache within minutes – long before he was actually satiated – and start screaming in pain. Once the pain receded, the hunger he experienced was so intense that the whole desperate process started all over again. Nursing became a never-ending story, so that it became almost impossible to leave the house. Not that leaving the house was a pleasant experience anyway. A dog barking. Another baby crying. The sound of traffic. Everything was distressing to him. Even in the safety of our home, a sudden sound like a sneeze, a cough, or the telephone ringing would elicit an intense startle response and end in panicky screams. Vacuuming was, of course, out of the question. Inviting visitors over – especially Moms with their own babies making who-knows-what sudden sounds at any given moment – was a nightmare. Idyllic visions of taking my baby to massage courses or swimming classes receded quickly into the unthinkable. What was going on? I knew long before my son was diagnosed with autism that he was sensitive. Extremely sensitive. I knew long before I understood the nature of autism that my son had no filters – that the world penetrated into him and overwhelmed him. The intense, alert look in his eyes that sometimes seemed wise and knowing, and that often unnerved people, was somehow, as Dr. Neufeld coins it, an “unnatural brightness”. My son was taking in more than his brain could handle. And his brain was working very, very hard to handle it. Dr. Neufeld speaks of the rapid brain growth that ensues in autistic babies as their brains try to process the mass of sensory input they are receiving as a result of the problems in their sensory gating system. And that this rapid brain growth can sometimes result in an increased head circumference. That would fit to my son. Doctors were noticing his unusually large head. Nothing dangerous, nothing really alarming as such, but noticeable enough that the doctors kept measuring it. I had heard that Einstein had had a big head as a child, too, so I tried not to worry. Maybe my child was just really smart. Well, he was smart. But that wasn’t the whole story. Intuitively I began orchestrating the world around us in order to make it more “palatable” for my son. I resisted pressures to “toughen him up” and, instead, tried to reduce input and protect him from overload – both sensory and emotional. I did these things intuitively – not strategically – although, as it turns out, these were wise things to be doing. Dr. Neufeld speaks of adults needing to take on the task of the sensory gating system for their hypersensitive child. In hindsight, I realize that this is what I was doing. At the same time, I was playing with my son as much as possible – singing, dancing, playing peek-a-boo, playing games with sounds and facial expressions – working very hard to engage him and create a shared world with him. As my son became a preschooler, we also started making up stories and wrote “books” about troublesome things like how scary playgrounds are or what it feels like when you hear a baby crying. Life was extremely intense and exhausting. I was working very hard, but at least my son was developing. At the age of 3 he taught himself to read. At the age of 5 he was able to google for information he was curious about (exotic musical instruments were his passion at the time) and he was trying to compose his first “symphonies”. He was also beginning to be able to tell me about how he experienced the world. How he could hear exactly what each instrument in a band was playing individually – which is why large orchestras and classical music were “way too much”; how he needed to touch things all the time when we were in the supermarket because otherwise the air would swallow him up. He was telling me clearly that he was taking in so many individual details that it was really hard to hold on to himself or a coherent whole. And that this was really scary. As my son got older, things got even scarier. What got added into the picture was the issue of separation. I hadn’t realized how much my strong attachment to my son had been shielding him and compensating for his hypersensitivity. I hadn’t realized how hard I had been working to “hold” his attention and help him focus on me. I had intuitively fine-tuned the dance of attachment with him so that I could “collect him, get his eyes, get a smile and a nod”, as Dr. Neufeld describes it, and “cut through” the swarm of details overwhelming him enough to weave an attachment “hammock” for him to rest in. This attachment “hammock” had always been fragile in a certain way – it was deep but easily broken and needed to be guarded carefully. So it was no surprise that it would break under the load of stimuli that school would bring. At school, our attachment hammock developed giant holes and my son fell through them. He couldn’t hold on to me enough to be shielded emotionally. And he surely couldn’t handle the sensory cacophony. So he gradually began to lose the alertness in his eyes. My son had always had moments of overload where he would “space out”, but now this “spacy-ness” became systemic. I felt my son retreating, detaching. I felt a tremendous sadness about this, but I also saw the necessity. It was all way too much for him and, as Dr. Neufeld so poignantly describes, when survival is at stake, the brain will move to protect the child from unbearable wounding by retreating or “shutting down” – on sensory, emotional, or relational levels. The price for this strategic move of the brain is high – it results in a developmental “stuckness” that brings with it its own share of problems (impulsiveness, aggression problems, for example), not to mention the price in terms of the unfolding of individual potential. Of course, I tried my best to hold on to my son. I desperately tried to compensate even more than before. I fought for understanding and supports in the outside world. And – I played and played and played with him. This was the time that we started making movies. We made up all kinds of stories; we played out every possible natural disaster: earthquakes, tsunamis, volcanoes; we died and grieved and came back to life over and over again. We learned how to edit film and how to highlight the emotions in the story by adding the appropriate background music. When we were done, we watched our films over and over again. All of this we did together. It strengthened our attachment. And it emotionally kept my son’s head above water at school. He played out his anxiety and his aggression in his movies. Or he became the powerful musical super-hero whose magical compositions would save the day. Dr. Neufeld emphasizes the importance of play, particularly for the hypersensitive. I can surely attest to its life-jacket qualities – not just for my son, but also for the autistic children and adolescents I ended up working with. Whether it be making movies, or painting, or playing piano, or playing hide-and-seek, or re-playing traumatic events, or just running and jumping together – whatever kind of play holds the attention of the child and makes their eyes come alive – this is the “royal road” of healing and growth. And thank goodness we are drawn to it intuitively. My journey with my son is still a very challenging one. Even as an adolescent, he is still plugging his ears at sudden noises, spacing out when overloaded, swinging for hours in his hammock to calm himself, or asking the same question over and over again. 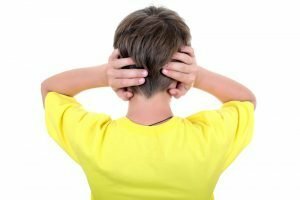 He is still needing what he needed as a child: someone who can help him “hold on” to his attachments; someone who can help him stay “soft” and adaptive; someone who will take the responsibility to do for him what his sensory gating system is not able to do (reduce stimuli, uphold structure). But he is beginning to develop a relationship with himself – getting a sense of who he is and what he needs – and beginning to move towards becoming his own person. He still has the impulse to play – nowadays it is mostly playing guitar and singing: Nirvana when he is frustrated; Morrissey when he is melancholic. Or to act out upsetting things that happen to him in order to vent and manage his emotions. And he still comes to me with his secrets, wanting to be his “true self” with me, as he tells me. Our relationship is deep and solid. So we are on a good path. We still have hurdles ahead. But I believe in him and in us. We will find our way through the maze. Jule will present a live one-day seminar, Autism & Play: Nature’s Answer on July 28, 2018 in Parksville, BC. Visit our event page for more information.